Sizing up the Enduristan panniers on the Metal Mule rack. Hard wiring in a 3-socket, 12-volt PTO off an accessory plug under the battery cover. 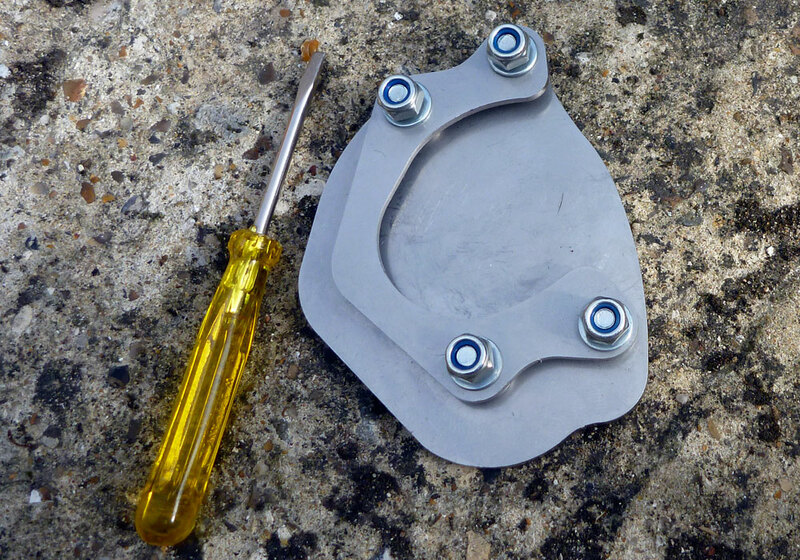 Fitting a larger side stand plate. Fitting an Aerostich wool seat pad. Fitting a couple of thick canvas pouches onto the engine bars. First discovery was that, at around half a metre long, the velcro straps on the Enduristan Monsoons were too short to throw over the back of the GS. They’d have been barely long enough even if the bike had not had a Metal Mule rack and would have flapped around on the offside as the 650 doesn’t have nice slab-sided sides like bikes of old. I believe throwovers are a throwback to simpler biking days when twin shocks kept them in place. 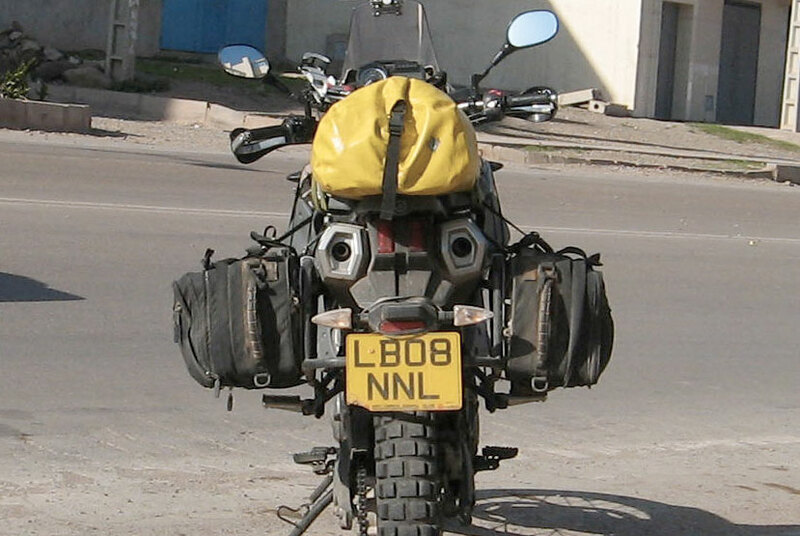 These days, for overlanding I’m not convinced it’s a long-term solution to soft baggage – a rack is needed or they’ll melt on modern cat pipes. And if you have a rack you may as well mount them properly. 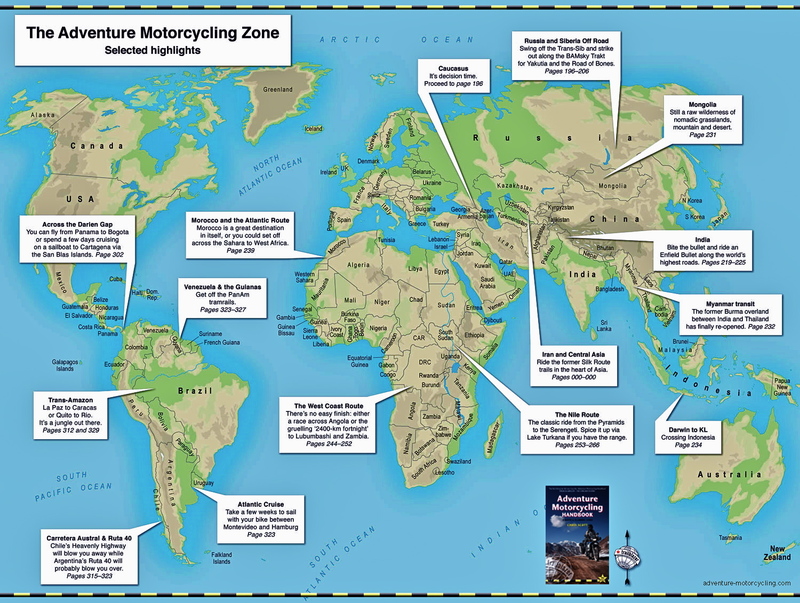 This has always been my plan with the Monsoon’s for my own bike, after the Morocco job is done. 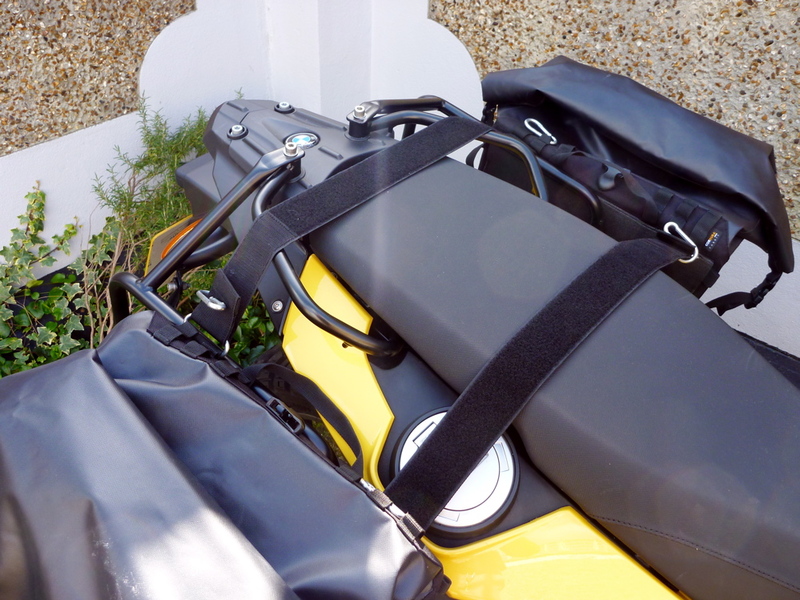 I was offered hard panniers by a couple of manufacturers but turned them down. Anyway, how to get round the strap shortage. In the end I decided on a solution with minimal intervention and easy field repair, and sewed in an extra six-inch loop with a mini snaplink to slip the Monsoon velcro bit back on itself (pictures below). 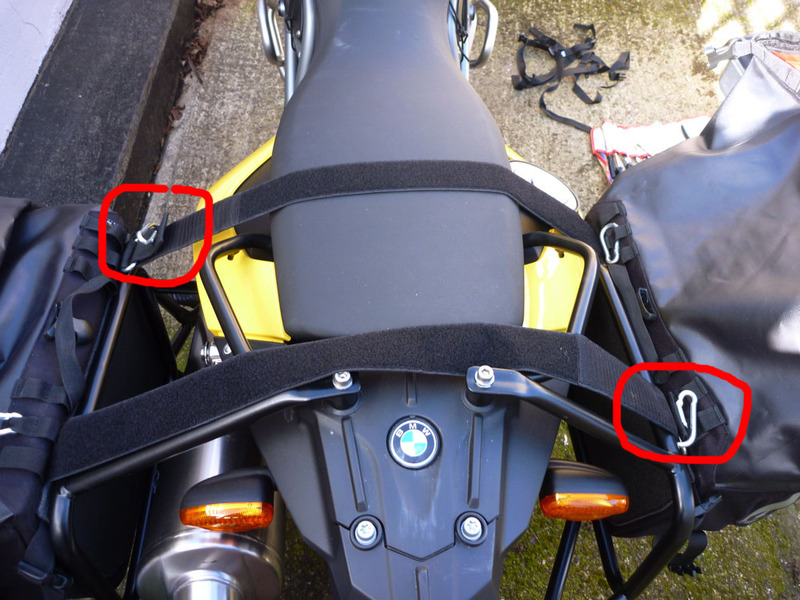 On the pipe side I hooked on a full-sized carabiner for the bag’s front location strap which clips to the pillion footrest; otherwise the strap would have melted on the nearby pipe for sure. And on the back of the rack I screwed on some hose clips with R clips to help locate the back location straps (see photos below). 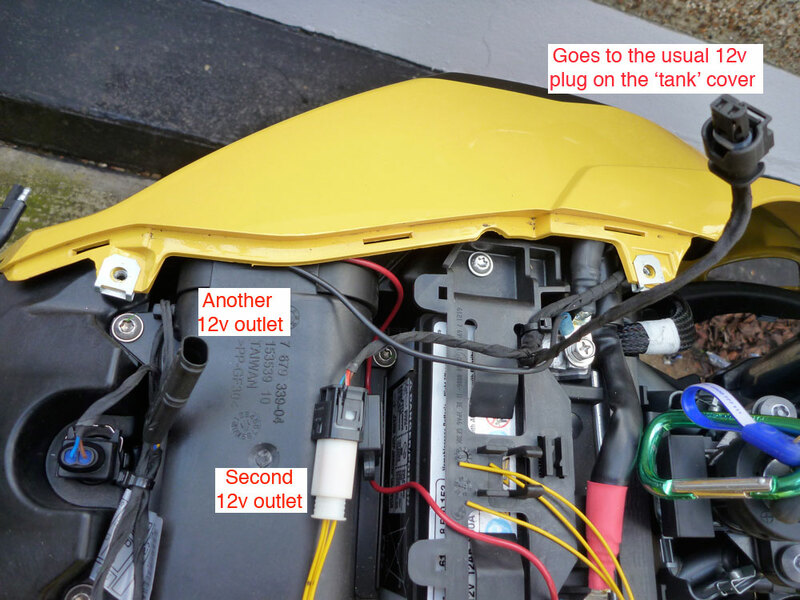 Under the tank there are at least two more 12v power take-offs, assuming you have the right BMW lead (the white plug with three yellow wires in the photo). With a bit of experimenting two of the three wires got screwed onto a 3-plug cig lighter socket jammed on the bars with duct tape and a ziptie. As with many jobs here, if this was my bike I’d do a neater, more permanent job. (Or would I…?) I like bodging for the main reason that it’s quick to do and easy to repair and I like to think there is an art to it. I read on ukgsers that these OE accessory sockets off the wiring loom are controlled by the ECU and disconnect fuselessly under all but the lightest loads (that’s why my heated vest is wired directly to the battery). I tried my mini air compressor in the plug and sure enough, it tripped after a couple of seconds, but worked after switching off and on (to trip again). Good to know, so I changed the leads on the pump to croc clips to wire directly to a lead I made off the heated vest connection. Similarly, I didn’t want to be welding bits to BMW’s bike (the voltages could put the ECU in a spin, even with the battery disconnected), so held back from getting a plate welded to the side stand foot. Instead I found a new Touratech screw-on plate on ebay for nearly half price. From my experience in the desert I’d say that this beautifully crafted bit of CNC’d alloy is about half the size it needs to be to support a loaded bike on soft sand. A cynical person could even say it’s a metaphor for the way things are these days: finely made and expensive bling that falls some way short of being functional. Anyway if it’s hopeless or breaks off I’ll remove the stand and get a proper steel plate about the sized of a fag packet welded on by a Moroccan metalbasher for five dirhams. 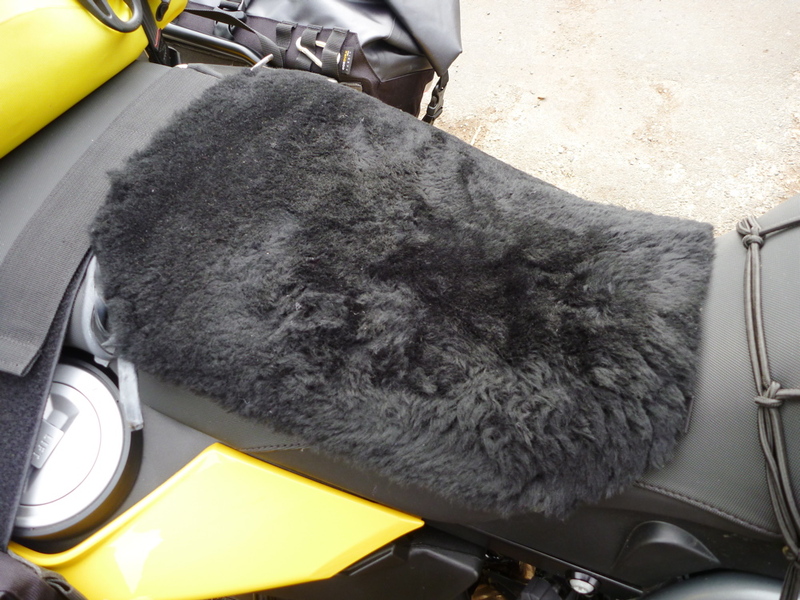 The Aero sheep’s wool pad went on with a couple of strips of pushbike inner tube (other elastics and hooks were supplied) and it’s certainly soft and furry to stroke; to sit on we’ll find out later. I can see someone nicking it, it looks so nice. Great thing with engine bars is that you can attach stuff to them. In my case a one-litre, thick canvas army ammo pouch that I think goes back to my very earliest desert bikes. In fact here it is on my Tenere in ’86. This one has a hole in it to take a 1.5 litre water bottle poking out the top. Others use plastic drainpipe with screw on caps, but these pouches made at least 50 years ago if not in WWII) are seriously thick and crash proof and cost next to nothing. 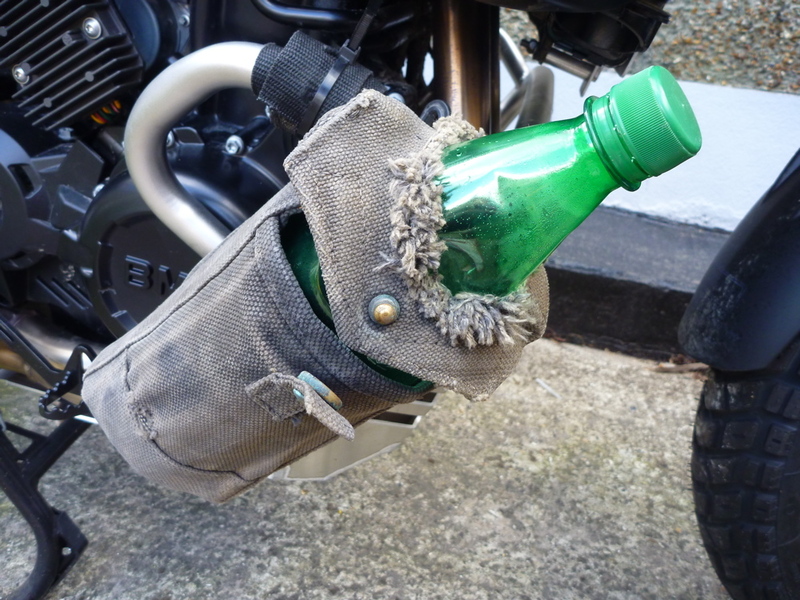 I liked mine so much I bought another pair off this guy on ebay for 4 quid each and fitted one on the other side: handy for oil, rags and whatever. Finally I had a look around the bike to see what extra tools are needed. 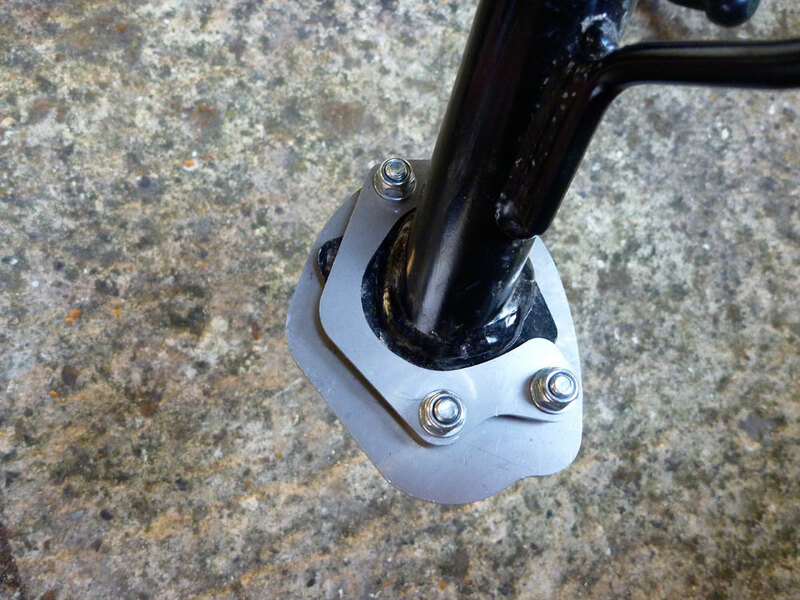 No great surprise to find that the 4-piece toolkit (right) clipped to the seat base has a limited range – though I’m still not sure what that 17mm is for; certainly not the front or back wheel which needs your own 24- and a 12mm to adjust the chain. There are plenty of those Torx fittings all around. 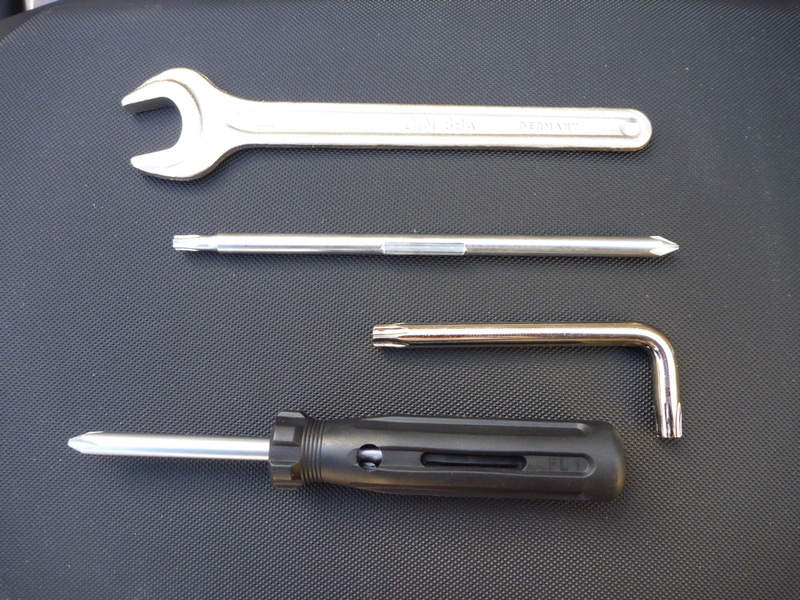 I have to say Torx are probably not just a way to make you buy new sets of tools but better than Allens and of course much better than the mushy cross heads and hex bolts of old. Sunday morning I set out to follow a 33-mile pushbiking exercise loop I occasionally do, from south London out into Kent past Darwin’s house, Biggin Hill aerodrome and along the course of the Pilgrims Way – the ancient route from Winchester to Canterbury which follows the base of the North Downs – and back north into London. 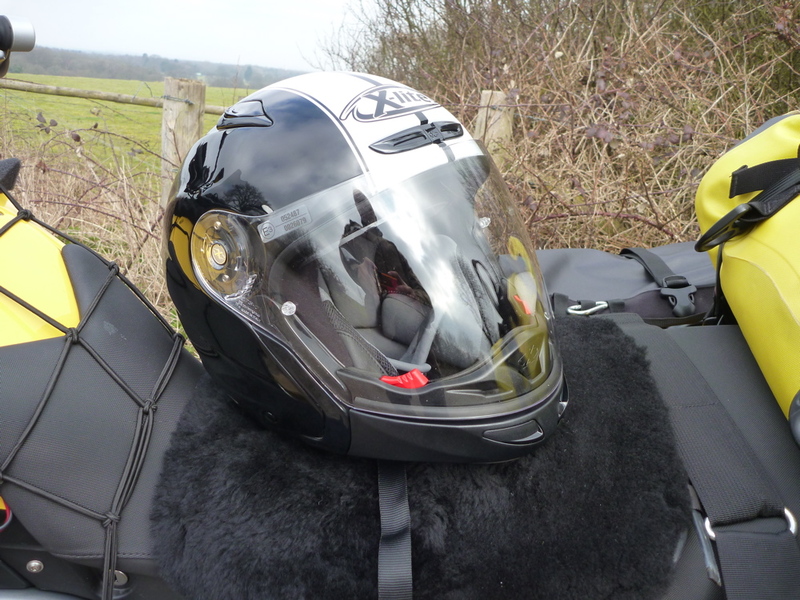 I was trying out a lot of new stuff that had just turned up: a chunky Aerostich Falstaff jacket (like a Darien but in waxed cotton), an X-Lite X402-GT modular helmet (right; I decided the Airoh TR1 was just too noisy). I was also wearing my Kanetsu hot vest (the right way round and inflated this time) and had a Nuvi on the ‘tank’ top under a net to see if it worked there (it didn’t). They’re great in cars but I’m not sure I can see me getting into these satnavs while motorbiking. I could be wrong (I was…) but it takes too much concentration to focus on it, let alone fiddle with it (I have no recall but I suspect this crash 9 years ago was caused by scanning the GPS while riding). Still, at very worst it will be a handy map to whip out of a pocket when needed and perhaps a high bar mount will work better. On this morning’s ride I knew where I was going, and across Spain I’ve managed for 30 years with maps and route details prepared or memorised in advance. 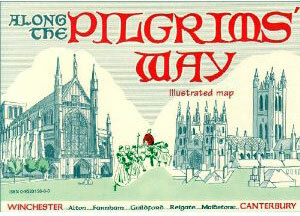 We shall see – perhaps I will become a convert (I did). The bike rode fine enough – the K60 tyres are still not as secure as the originals (only 40 miles old) but ought to prove their worth on the piste. My payload was about 21 kilos including 5kg of food; the departure weight will be a little more (50lbs), plus water. Not too bad, but heavy enough all hung out the back. I tried to set the bags as far forward as possible, but jeez this gear is wide. 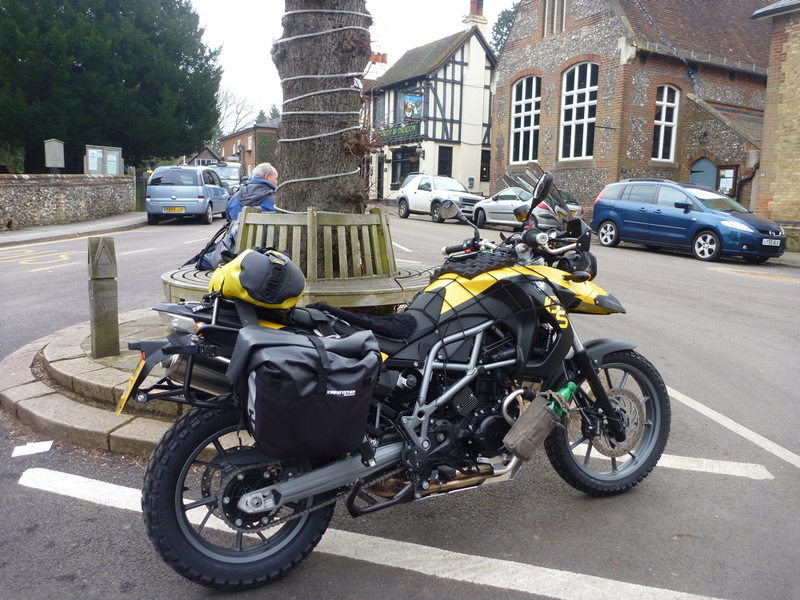 Probably even a little wider than the Tenere set up on TTech Zegas or a GS12’s barrels. I swear when this job’s over I am going to make a luggage system on a platform rack for my own GS: same roll-top principle with a stiffener inside, but long, set low and slim, not short, high and wide. I’m sure sticking out stuff influences handling and aerodynamics at high speed. At least it’s soft enough not to damage whatever it knocks into. The huge silencer is partly to blame; Metal Mule (and I bet Jesse Luggage too) sell an alternative pipe that tucks in better and takes a slimmer rack. You do wonder why silencers are round; maybe it’s cheaper that way. Nothing flapped, melted or fell off and the stiff back shock works a bit better with the weight, so other than trying not to knock off the Sunday morning drop-bar and lycra brigade, I was more pre-occupied with the performance of my cushy new X-Lite and Falstaff jacket which needs a good airing to get the pong of wax out of it. Another re-pack and all is set for the month’s run to Morocco in a couple of days. 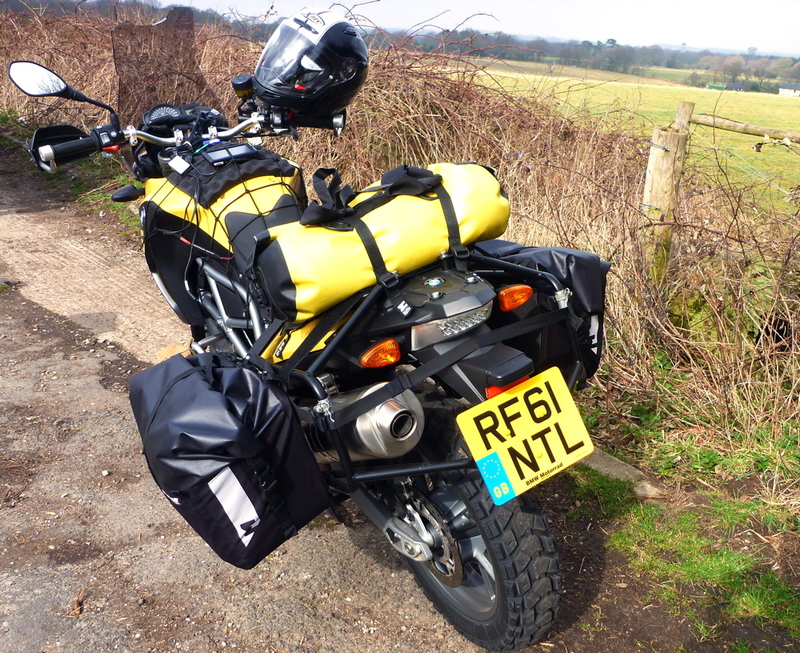 I don’t think I can face blogging out there – I like to get away from that stuff once in a while – so the full trip report on the 650 is here. 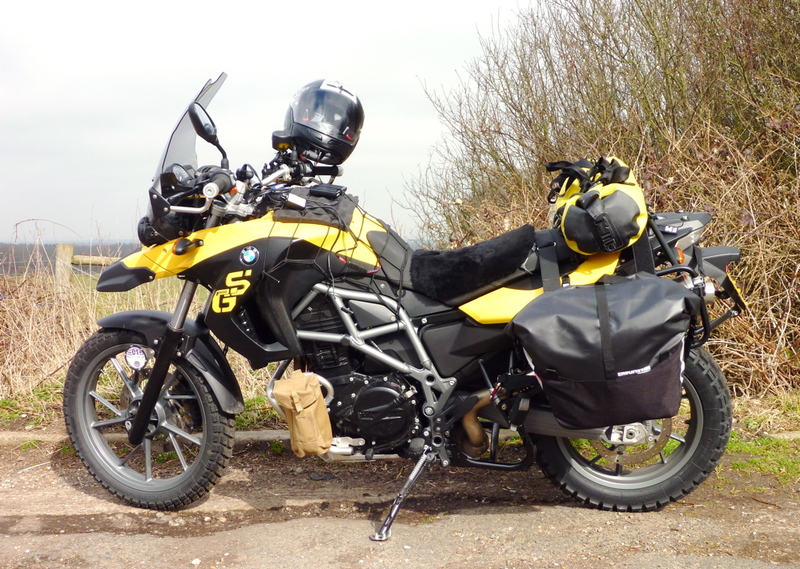 This entry was posted in AMH News, BMW F650GS SE long term test, Project Bikes and tagged Aerostich Falstaff jacket, Aerostich Kanetsu, Airoh TR1, BMW F650GS SE, Enduristan Monsoon panniers, Garmin Nuvi SatNav, Metal Mule rack, morocco overland, Touratech Zega Flex, X-Lite X402-GT, YAMAHA XT660Z. Bookmark the permalink.